When the Marys come after the Sabbath to complete the burial rituals on Christ’s body, they discover an empty tomb and, soon after, a risen, all-glorious Christ. Mosaicist Marko Ivan Rupnik envisions this pivotal event in salvation history as a glory-stream bursting up out of the belly of the earth, with Christ walking atop it, much like he did on Galilean waters, his robes billowing out in all directions. Victoriously, he pulls Adam and Eve up from their graves, up from the valley of dry bones, fulfilling the prophecy of Ezekiel 37. 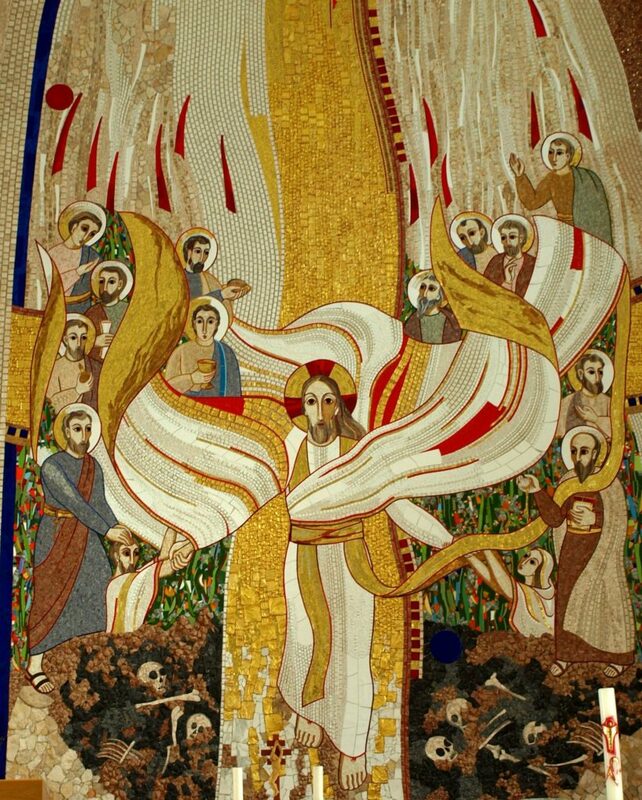 Tongues of fire fall from heaven, the Spirit poured out on the saints from all ages and nations, who, eating bread and drinking wine, are incorporated into Christ’s resurrection body. The vibrant greens and other colors behind this great ecclesial gathering signify a garden: new Eden. Victoria Emily Jones lives in the Baltimore area of the United States, where she works as an editorial freelancer and blogs at ArtandTheology.org. Her research focuses on ways in which the visual arts can stimulate renewed theological engagement with the Bible. She is in the process of developing an online biblical art gallery. You can follow her on Twitter at @artandtheology. Excerpted from “Journey to the Cross: Artists Visualize Christ’s Passion” (+ Part 2): As a devotional support for Passion Week and to show the breadth of Christian art across cultures, Victoria Emily Jones curated an online gallery of thirteen art images for the International Mission Board. Spanning the Last Supper through the Resurrection, the images come from the Democratic Republic of Congo, Japan, Bulgaria, the Philippines, China, Croatia, India, South Africa, Australia, Ecuador, Ukraine, Malaysia, and Slovenia.